Here are a couple of overview maps of IH10 West. IH10 from near Loop IH410 north to Loop 1604. IH10 from near downtown San Antonio north to Loop IH410. Photos start northwest of downtown and proceed westward. Driver's view westbound at Fulton Ave.
Driver's view westbound approaching West Avenue. Picture taken May 20, 2004. Looking westbound between West Avenue and Vance Jackson Road. Driver's view westbound approaching Crossroads Blvd. Driver's view westbound at Crossroads Blvd. Looking westbound from from the Callaghan Road overpass. Looking westbound from the Medical Drive overpass. 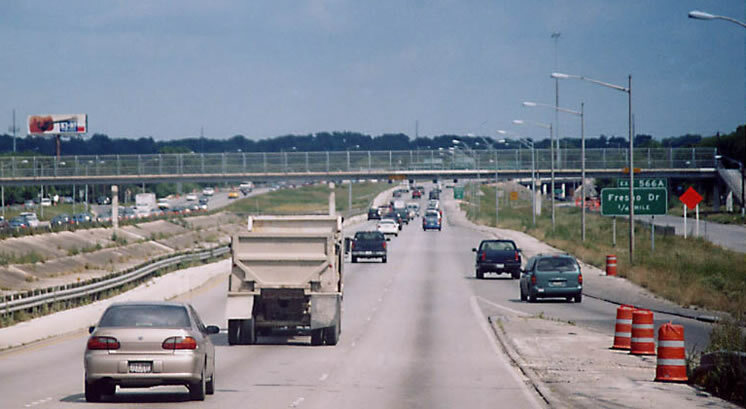 Looking westbound approaching the Huebner Road. Looking westbound at Huebner Road. Driver's view westbound approaching Fredicksburg Road. Looking westbound approaching De Zavala Road. Driver's view westbound approaching Loop-1604. Driver's view westbound at La Cantara Parkway. Eastbound at the on-ramp from La Cantara Parkway by Fiesta Texas. Aerial shot eastbound between De Zavala Road and Fredricksburg Road. Nightime view eastbound approaching Wurzbach Road. Looking eastbound from the Medical Drive overpass. Looking eastbound approaching Crossroads Blvd. The on ramp on the left side of the photo has now been removed. Looking eastbound at Croassroads Blvd. Looking eastbound between Vance Jackson and West Avenue. Looking northwest at some of the nice landscaping at the La Cantara Parkway intersection. Looking southwest at the same intersection.